Our four preschool classes serve children ages 20 months-3 years old. 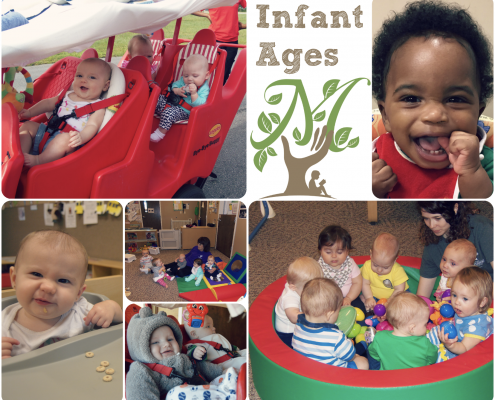 Unlike some daycares that lump children of a wide variety of ages into one room, our rooms are all developmentally appropriate. 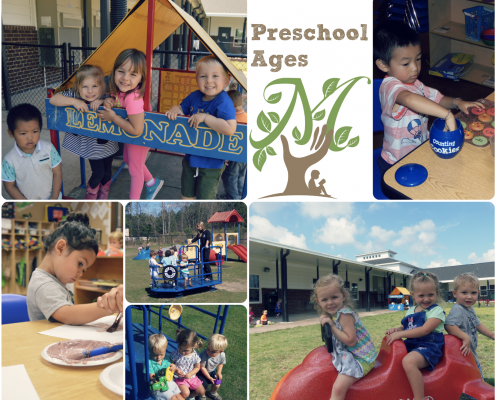 Between the four preschool classes, we have two separate playgrounds for each age group. We focus on several key components of brain and physical development to provide an enriching Preschool experience following WINGS curriculum and GELDS. Use materials to create artwork for self-expression. Explore various types of music and instruments from various cultures. Use music and movement to express feelings and energy. Understand, create, and retell stories, poems and finger plays. Recognize pictures, words, and ABC’s. Coordinate movements to perform tasks. Participate in a variety of indoor and outdoor activities to increase strength and endurance. Use hand-eye coordination to perform fine-motor tasks. Counting, identifying numbers, and associating a numeral amount with a given set of objects. Create, copy, and extend patterns. Recognize and describe basic shapes. Express feelings through appropriate actions and language. Sustain attention to a task or activity appropriate for age.